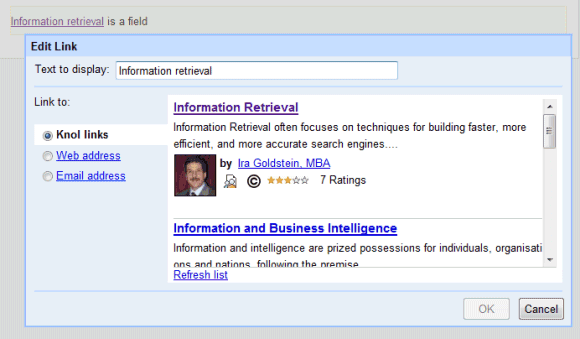 Knol, Google's knowledge repository, has recently improved the way articles are interlinked. When you create a link, Knol shows search results for the selected text, promoting its own content. 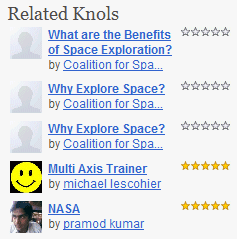 Unfortunately, it's hard to find high-quality articles other than the knols featured on the homepage. The top search results for [Yahoo], [marine biology], [Alan Turing] and many other popular queries are articles copied from Wikipedia. Knol could easily filter these articles from search results, especially considering that Wikipedia has a conflicting license. Did you spot any interesting knols? I found a well-documented history of Arctic explorers, a tutorial about photography composition and an introduction to usability. I wrote an article on Rationalism. Your link to Uasability actually links to an overview of Binary Economics. Wikipedia doesn't exactly have a "conflicting license". It all depends on the license chosen by the author of the knol. If it is a creative commons one without non-commercial or non-derivative clauses, it is compatible with Wikipedia's GFDL. And it looks like a lot of the knols are released under cc-by (attribution). IIRC that is the default license for knols, so overall there shouldn't be a conflict most times. Hmmm No RSS feeds on KNOL .. trying to subscribe to new articles.. that's weird. Regarding the conflict between GFDL and Creative Commons, read this page. "CC-by is one-way-compatible with GFDL - meaning that CC-by content can be used in GFDL work. No non-commercial license can ever be compatible with GFDL."